Trout of the World: An illustrated guide to the genus Salmo. By Paul Vecsei and Martin Hochleithner. The best guide about trout. Fisheries biologist Paul Vecsei and aquaculture specialist Martin Hochleithner are both internationally well-known experts in the field of trout research and culture. 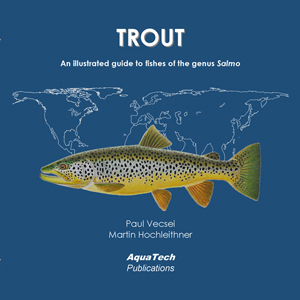 This book covers in detail all members of the trout genus (Salmo). It showcases the numerous taxa (species, varieties, morphs, forms, etc.) and highlights their plasticity. The chapter of each species includes informative text: classification, description, distribution, biology, conservation and literature. The useful text in this book is accompanied by more than 100 detailed scientific colour illustrations. Each illustration is of an individual fish and is extremely accurate, made using various techniques, some for the first time ever. Fish aficionados, trout specialists and art lovers will appreciate this unique work. Order NOW online (appears 2020)! 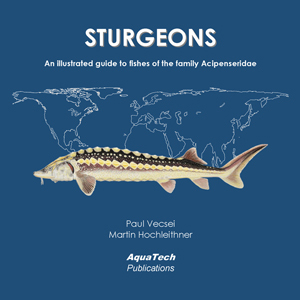 Sturgeons of the World: An illustrated guide to the family Acipenseridae. 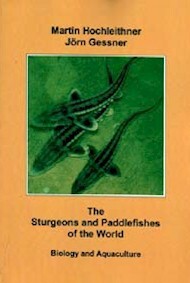 The best guide about sturgeons. Fisheries biologist Paul Vecsei and aquaculture specialist Martin Hochleithner are both internationally well-known experts in the field of sturgeon research and culture. 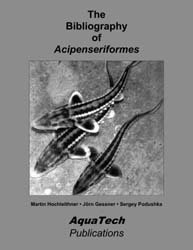 This book covers in detail all members of the sturgeon family (Acipenseridae). It showcases the numerous taxa (species, varieties, morphs, forms, etc.) and highlights their plasticity. The chapter of each species includes informative text: classification, description, distribution, biology, conservation and literature. The useful text in this book is accompanied by more than 100 detailed scientific colour illustrations. Each illustration is of an individual fish and is extremely accurate, made using various techniques, some for the first time ever. Fish aficionados, sturgeon specialists and art lovers will appreciate this unique work. Sturgeon Fishes (Acipenseriformes): Science as Art. 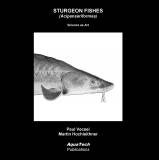 Illustrator and biologist Paul Vecsei and aquaculture specialist Martin Hochleithner are both internationaly well known experts in the field of sturgeon research and culture. In this volume, they showcase the numerous sturgeon species and highlight the plasticity of sturgeon morphology (both within and between species) using more than 130 detailed illustrations and many summary tables. The material in this book is the culmination of 5000 hours of scientific illustrations. Each illustration is of an individual fish and is extremely accurate. They are made in the technique of pointillism, a known fine-art technique. Each picture is made by small dots, which, when viewed for a distance, creates a very detailed rendition of shape and form. 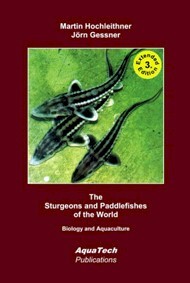 Sturgeon afectionados, sturgeon experts and art lovers will appreciate the collection of illustrations in this unique work. The Sturgeons and Paddlefishes (Acipenseriformes) of the World: Biology and Aquaculture. By Martin Hochleithner and J�rn Gessner. An extended, updated and reviewed third edition. Soft- or Hardcover, 248 pages. The breeding and culture of sturgeons and paddlefishes (Acipenseriformes) in captivity has advanced rapidly over the past several years. With recent developments, the requirements of the industry have changed, and the techniques used have also evolved and been adapted to meet these changing needs. Based on experience gained in the the former USSR, new technologies have been developed, and the background of sturgeon biology has been enlightened in many respects. This compendium is designed to close the information gap between scientists and practitioners. Its appeal will be far reaching since biologists, field technicians, hatchery operators and fish farmers, fisherman and fish enthusiasts, will all find a wealth of practical information relevant to their field of interest. The book has the style of a species synopsis coupled with everything anyone needs to know about the reproduction and culture of acipenserid fishes. It summarizes current knowledge on all sturgeon and paddlefish species worldwide and presents it as a practitioner-oriented working guide. It draws on the experience and research findings of the authors gained over more than two decades. The new, third edition has been updated, extended, and reviewed, and includes many new colour illustrations. It value will be timeless. - An introduction, with gross morphology, general ecology, systematics of sturgeons, and the sturgeon hybrids, as well as a reviesed key to the species. - A species section, with detailed description of all known species worldwide including their description, their distribution, their ecology, and their economy. - An aquaculture section, including the different methods of handling, propagation, incubation, feeding, management of tanks, ponds and cages. As well as an overview on fisheries techniques, stock management, product processing. - An annex, including sturgeon egg and larval development, parasites and prey organisms as well as international names and synonyms for the species. The Bibliography of Acipenseriformes: With over 10000 References. By Martin Hochleithner, J�rn Gessner and Sergej Podushka. The most important and comprehensive bibliography about Acipenseriformes. Available as searchable electronic version (on CD-ROM) or printed book version (over 500 pages). This bibliography, which covers all Acipenseriforms and a range of topics, is intended to serve as a ready reference for researchers, fisheries managers, aquaculturists and conservationists who work with this ancient fish group. It is the most important and comprehensive bibliography about Acipenseriformes, and includes nearly all publications from around the world. The numerous references are listed alphabetically by author(s) and chronologically by year(s), as the original title. They are cross-indexed to species and headings. Almost all sturgeon- and paddlefish species are threatened or endangered. Information on them is by no means complete, whether in fields related to sturgeon culture, biology, ecology or management. Due to the current rate of wild-stock exploitation and environmental degradiation, the availability of new information might prove crucial for their survival. This is an attempt to disseminate information about work carried out to date, and to increase its availability. The Bibliography of Acipenseriformes: Update of the 2000's. By Martin Hochleithner, J�rn Gessner, Sergej Podushka, Mohammad Pourkazemi and Qiwei Wei. An update of the bibiography for the years 2000-2009. Paperback, 280 pages (or allready included in the bibliography on CD-ROM). This bibliography, which covers all Acipenseriforms and a range of topics, is intended to serve as a ready reference for researchers, fisheries managers, aquaculturists and conservationists who work with this ancient fish group. 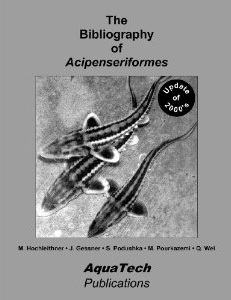 It is the most important and comprehensive bibliography about Acipenseriformes, and includes nearly all publications from around the world. The numerous references are listed alphabetically by author(s) and chronologically by year(s), as the original title. They are cross-indexed to species and headings. Almost all sturgeon- and paddlefish species are threatened or endangered. Information on them is by no means complete, whether in fields related to sturgeon culture, biology, ecology or management. Due to the current rate of wild-stock exploitation and environmental degradiation, the availability of new information might prove crucial for their survival. This is an attempt to disseminate information about work carried out to date, and to increase its availability. This update is allready included in the electronic version on CD-ROM. 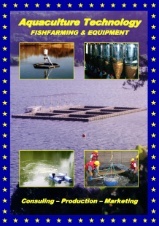 Aquaculture Technology: Fishfarming & Equipment (Catalog). 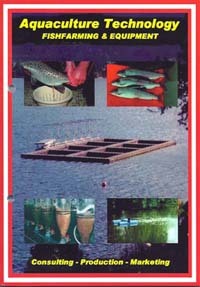 A product catalog of the company AquaTech. PDF-file or Softcover, 80 pages. The need and demand for fish and seafood are rising continually worldwide, and wild fish stocks are steadily becoming scarcer and scarcer. Aquaculture is a young and innovative part of the economy with high growth rates and secured prospects. The future of fish production requires that water be used as economically as possible, and that waste products be removed safely with the lowest possible energy consumption. Environmental legislation is progressively reducing the possibilities of open water fish production and existing fish farms are confronted with directives for purifying their waste discharges. This has accelerated the development of intensive, water-saving systems for fish production, which do not depend upon natural environmental factors. Through improvements to these techniques, very efficient and cost effective systems for both fresh- and seawater where developed. Because of extensive work and many years experience in fish farming, it's know how important it is to have secure, stable, safe and effective units and equipment. This knowledge is apparent in these systems, machines, instruments and accessories. 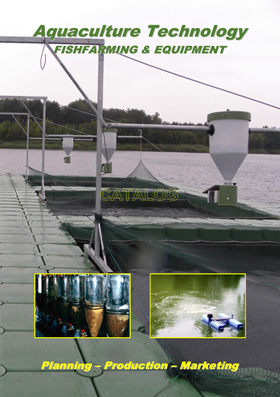 Offered is a complete program for aquaculture from the supply of single components like: incubation-, holding-, feeding-, aerating-, and processing-systems, to complete hatcheries and grow-out systems suitable for many species. If preferred, even complete, all-inclusive services  from consulting and planning to training and marketing, etc. Use this extensive experience and know-how to secure your success!